Joseph "Joe" A. Baril Sr. Celebrating the life of Joseph "Joe" A. Baril Sr.
Be the first to share your favorite memory, photo or story of Joseph "Joe". This memorial page is dedicated for family, friends and future generations to celebrate the life of their loved one. 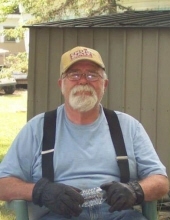 Obituary for Joseph "Joe" A. Baril Sr.
Joseph A. Baril, Sr, 69, Wrightstown, passed away Friday, January 11, 2019 in Brillion. He was born September 5, 1949 in Green Bay, a son of the late Orville and Dorothy (Splan) Baril. On June 30, 1978, he married the former Debra “Deb” Jahnke in Our Savior Lutheran Church, Denmark. He is survived by his wife Deb of almost 40 years; son Joseph (Julie) Baril, Jr; daughter Sheena (Steven Kittell) Baril; grandchildren: Harmony Baril, Drake Baril, Liberty Baril, Nolah Kittell, and Noble Kittell. He is further survived by his siblings: Bill (Peggy), John (Linda) Elaine Wingo, and Barb (Steven) Hanke; his father-in-law Alton Jahnke; brother-in-law Jim (Kelly) Jahnke; sisters-in-law Cindy (Michael) Cleven, Karen (significant other Lee) Baker, Dana (Randy) Carter, and Laurie (Larry) Van Boxtel; nieces, nephews, and dear friends Dan (Claudia) Zittlow. He was preceded in death by his parents; son Jamie Borchardt; sisters: Bonnie (Richard) Van Rossum and Judy (Robert) Pennenberg; brother Terry Baril; mother-in-law Nancy Jahnke; brothers-in-law Hill Wingo and John Jahnke, and dear family friend Howard Martin. Family & friends may visit from 3:00 to 6:00 PM on Wednesday, January 16, 2019 at RYAN FUNERAL HOME & CREMATORY, 305 N. Tenth St, De Pere. A service will follow at 6:00 PM with Barb Hanke officiating. Joe’s ashes will be laid to rest with his parents in the South Lawrence Cemetery in June 2019. A big thank you goes to Heartland Hospice, Brillion West Haven, Bornemann Community, Lakeland Care, and all the family and friends who have been there for Joe and his family. To send flowers or a remembrance gift to the family of Joseph "Joe" A. Baril Sr., please visit our Tribute Store. "Email Address" would like to share the life celebration of Joseph "Joe" A. Baril Sr.. Click on the "link" to go to share a favorite memory or leave a condolence message for the family.